Innova 3160g Review – Entry Level Price… Professional Performance? This is one of the higher-end scanners on the market today. It's able to connect to many of the common cars out there today and display codes to help you with solving problems. This can help you to save time, clearing out codes quickly. It also saves money over visiting a mechanic for a potentially small issue. The Innova 3160g tool is a great-looking tool. It is sleek and stylish, allowing you to hold it comfortably and ergonomically in your hand. The casing also stands out from the screen so if it is dropped, the screen is unlikely to crack. The buttons are well placed and allow you to use both hands to manipulate the menus. The shape of the buttons also helps you to know which button you are pressing by feel alone, so your eye is not drawn from the screen as much. ​The screen itself is large enough to give you all of the information which you need. The scanner is connected to your vehicle by a cable which can also be unattached from your device for better portability and storage. The cable also provides the power to the device, but you will also need batteries to power the device. There is no Wi-Fi capability, but there is a Bluetooth connection available so you can use this scanner in conjunction with your phone or tablet. This device has all the functionality of an OBD2 device. 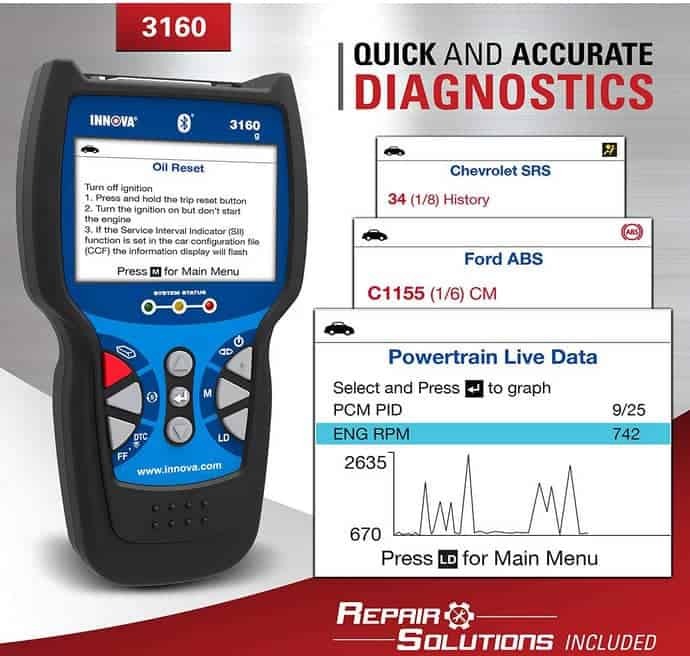 You can read and reset trouble codes, read and reset most manufacturer-specific codes (including air braking systems, supplemental restraint system, batteries, oil, and much more), view and export live data, view, and export freeze frame data, and connect to another app via Bluetooth. 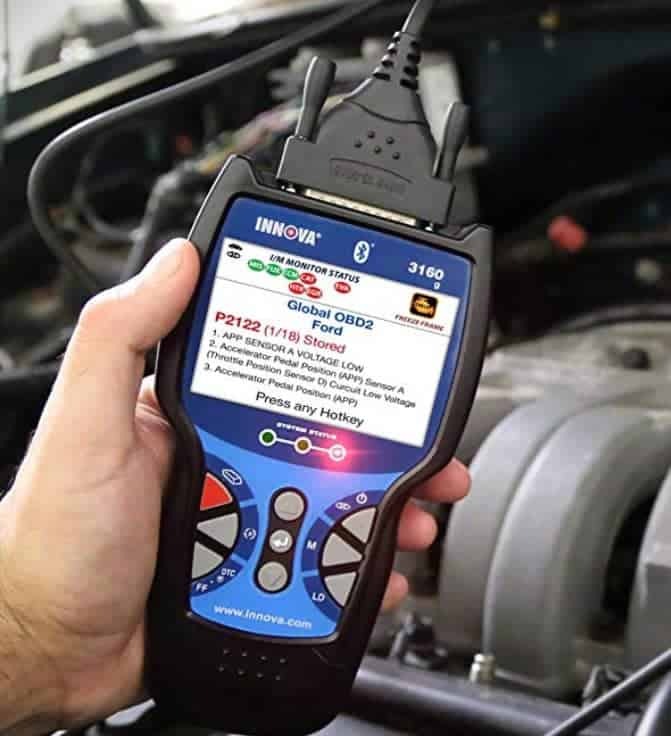 This scanner is compatible with all OBD2 compatible vehicles from 1996 and later. While this scanner will read manufacturer codes also, it will not be able to read all of them. The scanner is also able to read multiple protocols, including ISO 9141, Keyword 2000, J1850 PWM, J1850 VPW, and CAN protocols. You can view the system data in English, French, and Spanish. The Repair Solutions software will help you to find the root cause of the problem and then give you options on how to fix problem. The software will help you to pinpoint where the problem is coming from and which parts need to be replaced. Innova is great at updating software, meaning that your device will be future proof. With so many new vehicles being released, all with new components and new system codes, it is important that your device is able to read these codes. If your scanner cannot read the codes, it is rendered useless. Thankfully, Innova is great at releasing software upgrades for the device. ​A great benefit of this device is the Bluetooth capability. What makes it stand out from the other devices on the market is the ability to use this as a standalone device or in conjunction with an app on your smart device. If you have a simple job for your scanner and want to just do a basic scan to find the problem, then you can plug in the scanner and do so. If you wish to do a full diagnose and have the power to convert that information into data-rich presentations, then you can use the app with the device. 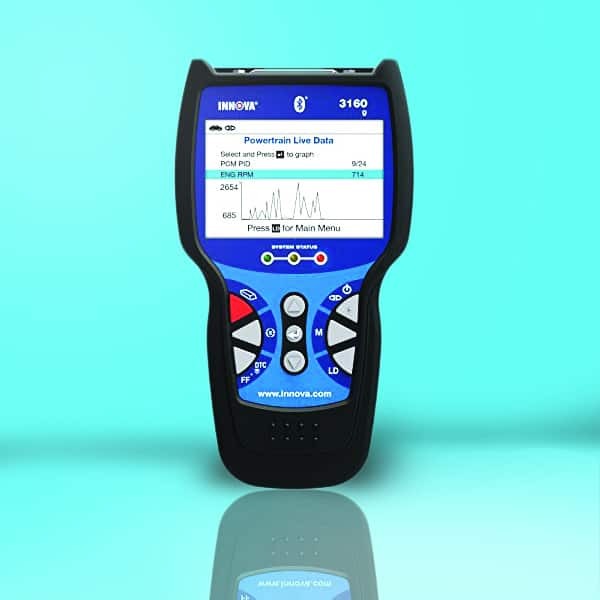 This means that you can easily diagnose complicated problems, future problems, and interpret data which you would not be able to with a standalone device. Many standalone devices have small screens, but this scanner benefits from a large screen which is backlit. Even in low-light conditions, you are easily able to see the data presented. The Innova scanner is more complicated than a regular standalone scanner so it cannot be powered directly by the vehicle battery itself. The powerful device needs 3 AA batteries to power it. This does mean that you will need to purchase either rechargeable batteries or buy new batteries when they run out. While the scanner comes with a great built-in software package for suggesting repairs, this package is only subscribed to for a year. After that time, you need to pay for another year’s subscription to be able to keep using it.